This incredibly accurate 3D printer can reproduce intricate models -- but is also costly and slow. The Formlabs Form 1+ 3D printer ($3,299) is elegant in its simplicity, and more capable of producing accurate models with detailed intricacy than any other 3D printer I've reviewed. This printer also received some of the highest ratings for desktops on 3DHubs, a user site that rates 3D printers based on more than 2,200 reviews. So why shouldn't anyone interested in a desktop 3D printer run right out and buy this one? Because along with being accurate, the Form 1+ is pricy, messy and has an optical system that is finicky by design. 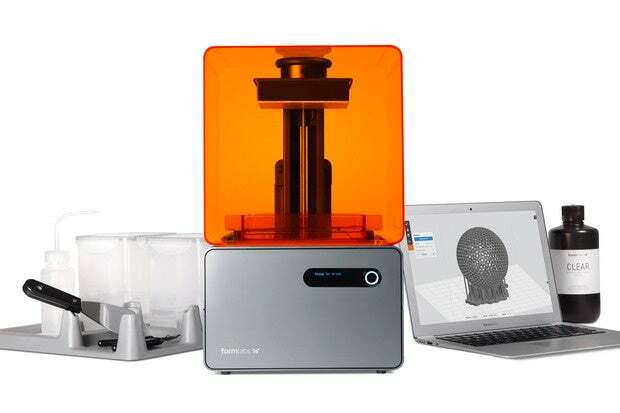 Unlike more popular fused filament fabrication (FFF) 3D desktop printers that melt and extrude layers of polymer filament, the Form 1+ employs stereolithography (SLA). The printer uses a highly accurate, 405nm-beam violet laser to draw a pattern in a basin of photosensitive polymer resin. As the laser strikes the pool it hardens layer by layer, and the object is lifted out of the pool on an inverted platform. Yeah, the cool factor runs high with this machine. The result of using a laser and resin is the ability to create remarkably smooth surfaces -- so smooth you can't even feel the layers as you always can with FFF 3D printing. The laser also allows for mind-blowingly intricate detail. The Form 1+ 3D printer is wonderfully small and light. It's 26 x 20 x 19 in. and weighs just 28 lb. I've lugged 70-lb. machines around and it's not fun. The printer has a build area of about 5 x 5 x 6.5 in. 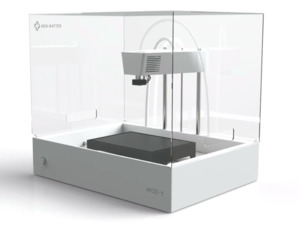 By comparison, MakerBot's popular Replicator FFF 3D printer, which sells for $2,899, has a build area of 9.9 x 7.8 x 5.9 in. The look of the Form 1+ is minimalist: A gray, solid cube on the bottom contains the optics, electronics and mechanics, while a hinged, transparent orange cube hood on the top protects the print platform and square resin tank. The hood is colored orange to protect the light-sensitive resin. A hinged, transparent orange cube hood on the top protects the print platform and square resin tank. On the front of the machine is a small green LED screen with an on/off button that also acts as a menu option selector. That's it. One button controls the power and prints, including the ability to pause prints and cancel them by holding the button down until a three-second countdown tells you the job is about to end. It's a really smart design. The Form 1+ is also the quietest machine I've reviewed, because instead of a mechanical print head and print platform moving back and forth through gears and pulleys on multiple axes, there's just a silent laser. The only movement comes from the resin tank, which tips back and forth, and the print platform, which moves up and down. I will note that there's a slightly annoying intermittent beeping sound that, while not loud, is somewhat shrill. However, after your first print job, you can tune it out. One of the pluses of this machine is onboard memory. Once an .STL file is uploaded from a computer to the printer, you can disconnect the Form 1+ and it will go on its merry way printing. Setting up the 3D printer is simple. You remove some protective Styrofoam, plug in a power cord and connect a USB cable to your computer. Next you fill the clear acrylic tank with photopolymer resin. After downloading Formlabs' PreForm CAD/management software from its website, you're ready to print. The PreForm software allows for a generous amount of CAD object manipulation. You can inspect every layer of an object before it's printed, or select from several layering thicknesses: 25 microns (.025mm), 50 microns (.05mm), 100 microns (.1mm) and 200 microns (.2mm). The PreForm software allows for a generous amount of CAD object manipulation. To put that in perspective, 100 microns is about the thickness of a sheet of paper or a human hair; 7 microns is about the diameter of a red blood cell. So, we're talking small. The first object I printed with the Form 1+ was a paper clip in the shape of company's butterfly logo. I downloaded it from the company's pre-approved .STL model website. I discovered then that this isn't a fast machine. The clip consisted of 579 layers, and it took one hour, 55 minutes to complete using a 1mm (100 micron) layer thickness. A model similar to this clip's size and shape would likely take less than an hour on a decent FFF 3D printer. Additionally, the butterfly clip had a lot of excess support material that required a great deal of snipping to remove, and it left behind some jagged edges that needed additional post-print smoothing. What I did find impressive about the Form 1+ were file load times. An .STL file of an iPhone 6 case with 1,407 layers (printed top to bottom vertically) took about a minute to load; even better, the print job started before the entire model had been uploaded. The iPhone case, however, took four hours to build. I built a similar case with the Lulzbot Mini 3D printer in about one and a half hours. Another drawback of this machine is that models can be really hard to remove from the detachable print platform. While the platform is well thought out in that it easily detaches with one simple lever, you're left with a resin-covered platform that you then have to scrape with a spatula to pry the model off. Every 3D printer requires this rather inelegant model removal process, but some machines have better print surfaces than others. The Lulzbot Mini 3D printer I reviewed had a really remarkable surface that allowed most models to almost pop off with a tug. But for its part, the stainless steel surface of the Form 1+ does not make model removal easy. To make work a bit less arduous, included with the Form 1+ are a finishing tray and accessories package that act as a post-printing workspace to help clean up and put finishing touches on a printed piece. The printer's build platform fits snugly into one of the tray's compartments, so it doesn't slip and slide around when you're jabbing at it with the spatula. After you print an object, it's covered in gooey resin. Once you've scraped it off the platform, you have to agitate it in a bath of isopropyl alcohol for two minutes and then let it sit in the bath for another 10 minutes. The company then suggests you give it a second rinse -- this one 12 seconds long -- in a separate tub of isopropyl alcohol. I found some objects needed even more time in the alcohol bath before they'd been de-slimed of the resin. Thankfully, you're also given a large ziplock baggie of rubber gloves to protect your hands from excess resin and the alcohol used during post-print processing. The resins come in four colors: clear, white, gray and black. And, like the printer, they're quite pricy -- for example, a one-liter bottle of resin costs $149. (The resin tank holds 200 millileters; you can make approximately 5 to 10 objects -- depending on the size of the objects -- with one full tank.) Additionally, resin tanks must be protected from ambient light or the liquid will harden. By comparison, a two-pound spool of polymer filament for a FFF printer sells for as little as $29 and will print just as many objects, if not more. Other issues: I found that after a few print jobs, I had problems with smudging on the bottom of the optically clear resin tank; that affected the optics and the machine's ability to print. The fix is to purchase a special spray cleaner and wipe the tank down with the supplied microfiber cloth. I didn't have any spray, so effectively, I was done using the printer after a few jobs. A Formlabs technician told me that the resin tank can become fouled after using one to two bottles of resin. Once the optically clear resin tank becomes permanently smudged, the laser can no longer accurately trace the CAD image in the resin and you’ll be required to buy a new tank for $59. Formlabs also sells the removable print platforms for $99 each -- after you’ve scraped at the metal surface for a while, it can become marred, which can affect print object adhesion. So over time, you could end up spending a significant amount of money on replacement parts just for upkeep. Why would you buy this machine? So after all the possible problems with this machine -- the price, the slow speed, the post-printing processing -- you may be wondering why I'd ever recommend it. The answer comes in one word: Precision. 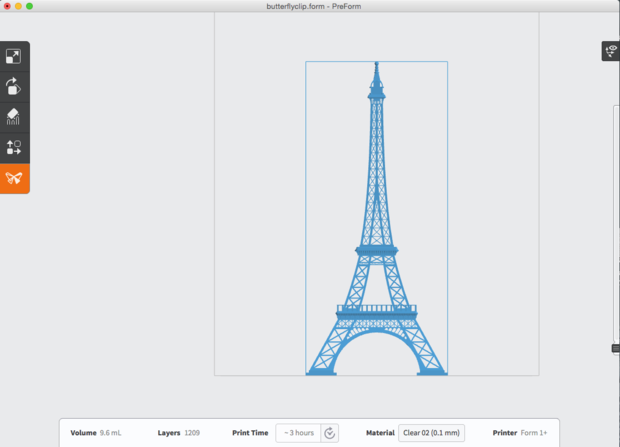 The most stringent test I've found to date for checking a 3D printer's accuracy is a 5-in.-high Eiffel Tower model I found on MakerBot's website Thingiverse. The tower's scaffolding challenges a 3D printer to complete an intricate web of design. In my experience, only one printer completed the task flawlessly: the Lulzbot Mini. Until now. The Eiffel Tower model consists of 1,209 layers, which took the Form 1+ three hours to print. I printed it without support material, as I've done with many other printers, to ensure it could be completed without a lot of post-print processing. The Form 1+ printer added intricacies I didn't even know existed on the original download -- because other printers had simply excluded them. After printing the tower, I was amazed at the miniscule scaffolding cross-sections. A pedestrian handrail on one of the tower's catwalks had been reproduced on one other printer, but it was done with exquisite precision on this one. I found myself picking up the model over and over again to marvel at its detail. I also found that Formlabs' PreForm software was excellent in positioning models for the most effective printing job. For example, the "Smart Support Structure" feature automatically decides where to place scaffolding on a model to ensure a sturdy model. The software also allows a great deal of support material manipulation, adding greater or lesser density and reducing the thickness from .40mm to 1.30mm. The PreForm software, however, allows for a minimal amount of object customization. With it, you can only import a model, align it and resize it. You can also make duplicates of the model in order to print more than one at the same time. One feature I loved about the software was the ability to inspect each layer of a model build. This is important to ensure a quality print; you can literally look at each layer in a model with more than 1,000 levels, to see how each will be printed, and therefore determine how well each layer will turn out. The Form 1+ ships with a one-year warranty. The machine can produce eye-popping detail, so it would be a standout for use in precision prototyping of parts. On the other hand, its ability to produce accurate detail must be balanced with its slow speed and the inconvenient post-printing processes, such as model removal and cleanup. I'm impressed with the overall design of the machine, its quiet function and range of layer thicknesses, which ultimately affect the time it takes to print something. In the end, I found myself torn between admiring it because of its ability to produce objects with remarkably accurate and smooth surfaces -- and wanting a simpler printer that could just build a "good enough" object. This is a machine for enthusiasts and professionals, not the average consumer looking to fiddle with 3D printing. If you know what you're doing, you shouldn't be disappointed with the results. I can highly recommend the Form 1+ for those prosumers to which it's marketed, but I'd encourage typical makers to steer toward a simpler FFF desktop printer. This story, "Review: Formlabs Form 1+ 3D printer offers mind-blowing precision (video)" was originally published by Computerworld.